Back in August I received an item from my BNT Beauty Box that quite baffled me. Whenever BNTNews would send a blogger her box, they also send us an email that has product list and description of the items that we would receive. I was supposed to get the Catalina Geo Color Capsule Makeup Base but then I was sent the I-MIIX Magic Capsule Silky Make Up Base instead. They are made by the same company but packaged differently to attract probably a different audience, but I was assured that both are made equally the same. Finally, the day came for me to finally review the Catalina Geo Color Capsule Makeup Base. In this review I'm going to compare the I-MIIX and the Catalina Geo just to make sure they are the same and also to see if one or the other is better since I received a different color capsule this time around. I do have to give it it to Catalina Geo Color Capsule for the packaging. I definitely prefer this kind of packaging since it looks more professional and high end. This product is a color correcting makeup base which is made of visible color capsules. It fixes skin tone, protects from UV rays, improves natural skin color and also provides hydration and extends makeup wear. It also claims to be free of any oil so it is safe for use especially for sensitive skin type. 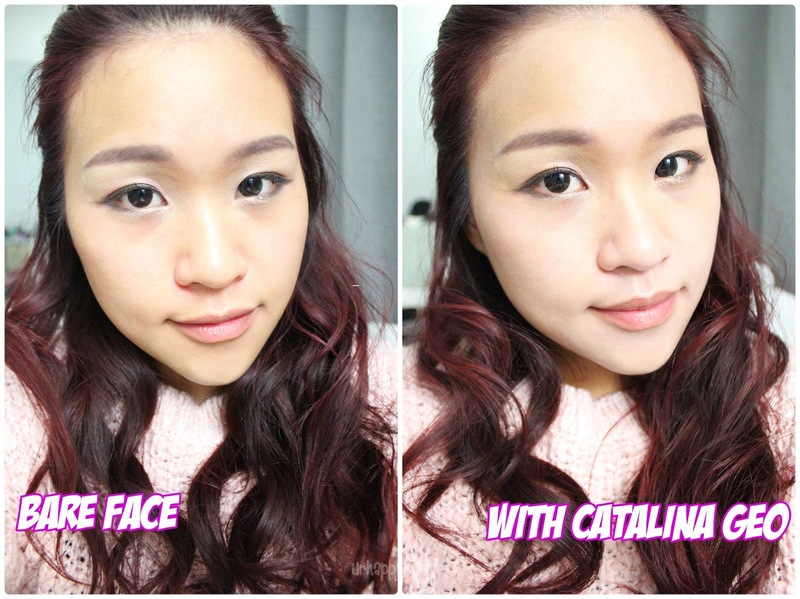 The Catalina Geo Color Capsule Makeup Base comes in five shades: pink, violet, green, white and blue. I have received the violet shade. I copied this list of color correction guide from my review on the I-MIIX Magic Capsule Silky Make Up Base so that it would be easier to determine what each color does for the skin. So as you can see on the bare face comparison photos above, it does look like there was a brightening effect. The skin tone seemed to be more even - less redness and dullness. Texture is smooth and lotion-like with a hint of floral scent. My face also didn't feel hydrated nor dry. These are both the same findings as I had with the I-MIIX Magic Capsule. There really isn't much of a difference between the pink and purple based color capsules as well. The only major difference is the staying power. I have previously complained that the I-MIIX didn't do anything to extend my makeup (4 hours maximum) and wasn't good with oil control on a hot, humid day. Well, the Catalina Geo Color Capsule works the opposite. It is very good with extending my makeup and oil control was decent. I'm not completely saying the other one is better or different because I have to factor in the seasons which I tried out each product. I tried the I-MIIX Magic Capsule during the midst of summer so it was understandable why my skin was producing more oils then. This time around I'm trying out the Catalina Geo Color Capsule during winter where my skin is drier than other times of the year. Both I-MIIX and Catalina Geo are quite impressive since they both make my makeup look so flawless whenever I use it as a makeup base. I also tried using this just to freshen up my bare faced look and it does the job of making your skin look rejuvenated on those lazy, no makeup days. I really do like this product this time around so I'm going to make use of this as much as I can now that the weather still permits it since I don't want to be a greaseball again when it gets warmer. I think this product is worth a try if your looking for a good color correcting base. I also recommend this product to those who are more on the drier side of the scale. This retails for 47,000 Korean won, which is about $47.